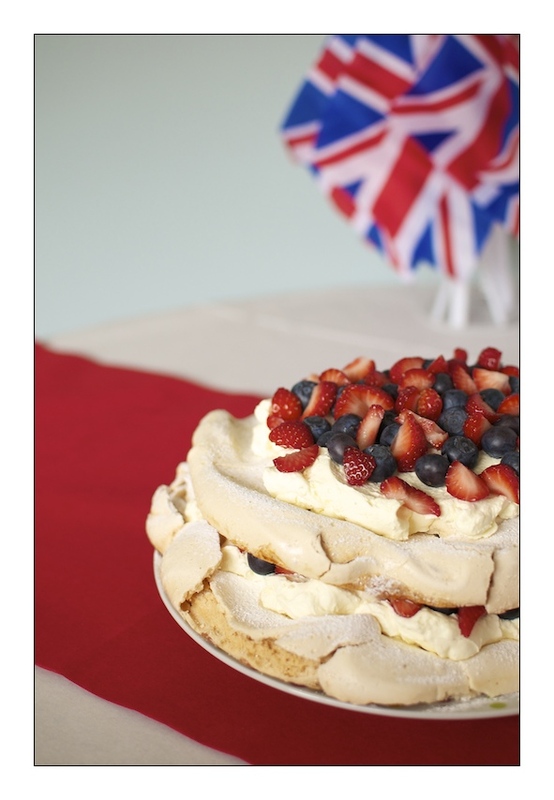 Red summer berries, blueberries and the white meringue make this a perfect dessert for a Jubilee party. Preheat oven to 130C/gas 1/2. Line two trays with baking parchment. Draw a 20cm circle on one, and a 16cm circle on the other. Put the egg whites in a large, clean, dry bowl. Add the cream of tartar and whisk on low speed for 1 minute. Increase the mixer to high and whisk until stiff and glossy. Mix the sugars together. Gradually add to the egg whites, a tablespoon at a time, whisking until stiff again after each addition. Whisk in the vanilla extract. Spread on the circles and level the tops. Bake for 2 hours 30 minutes – they’re ready when you can easily peel off the baking parchment. Leave to cool. Whip the cream until softly whipped. Remove the green tops from the strawberries, then quarter or halve them. Generously spread half the cream over the larger meringue. Scatter with two-thirds of the berries, then top with the smaller meringue and the rest of the cream and fruit. This is a classic cupcake, it can be dressed in a variety of icings or frosting’s and adorned with decorations that will take it from one occasion to another. Preheat oven to 180C/gas mark 4 and line 2 12-hole muffin trays with cupcake cases. In a large mixing bowl cream the butter and sugar until pale and smooth, about 3-5 minutes with a hand held electric mixer. Add the eggs, one at a time, mixing for a few minutes after each addition. Add one-third of the flours to the creamed mixture and beat well. Pour in one-third of the milk and beat again. Repeat these steps until all the flours and milk have been added. Carefully spoon the mixture into the cupcake cases, filling them to about two-thirds full. Bake for about 25 minutes or until slightly raised and golden brown. To check they are cooked insert a skewer in the centre of one of the cakes – it should come out clean. I a bowl beat the butter, milk, vanilla extract and half the icing sugar until smooth – this can take several minutes with an electric hand mixer. Gradually add the remaining icing sugar and beat again until the buttercream is smooth and creamy. 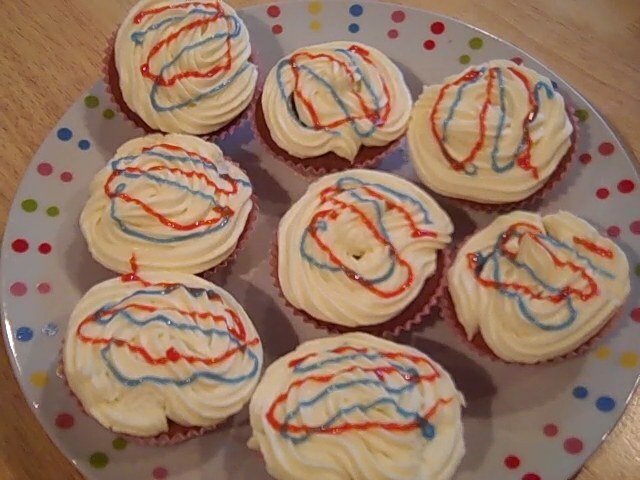 Pipe onto completely cooled cupcakes, then top with Jazzies or squiggle on coloured icing. These were really appropriate for the day. Preheat oven to 180C/gas mark 4. Line two, 12 hole bun trays with cupcake cases. Beat the butter and sugar until creamy. Beat in the eggs, one at a time, adding 1 Tbsp flour with each one, and beating well after each addition. Fold in the rest of the flour along with the sultanas. 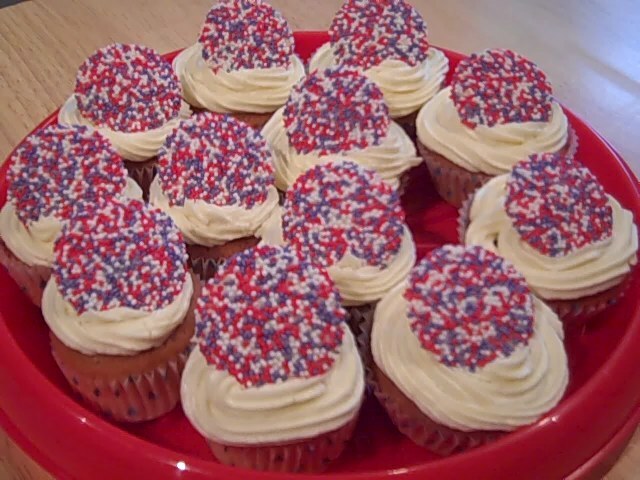 Put the mixture into the cupcake cases and bake for 20 minutes or until the tops spring back when lightly pressed. Cool. 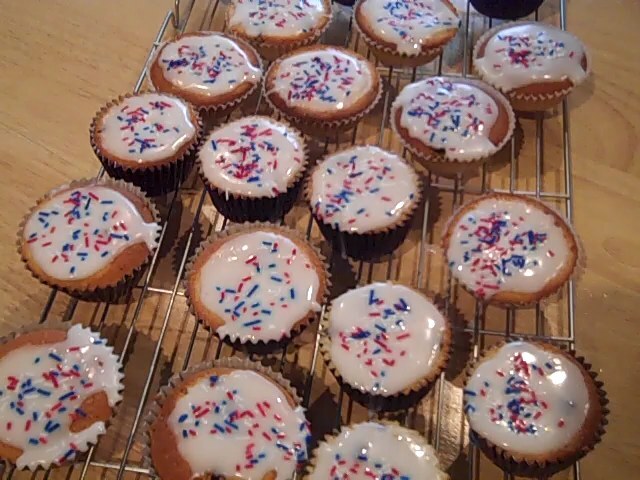 Mix the icing sugar with 2 Tbsp warm water to make a coating icing and spoon a little onto each cake. Finish off by sprinkling on the sugar strands. Line 2 8ins/20cm sponge tins with baking parchment. Add the flour and salt to the mixture, folding it in with a metal spoon. Divide the mixture between the tins and smooth off the tops. Place in the oven and bake for 25 – 30 minutes until well risen, golden brown and beginning to shrink from the sides of the tin. Remove from oven and allow to stand for 5 minutes before turning out onto a wire rack to cool completely. 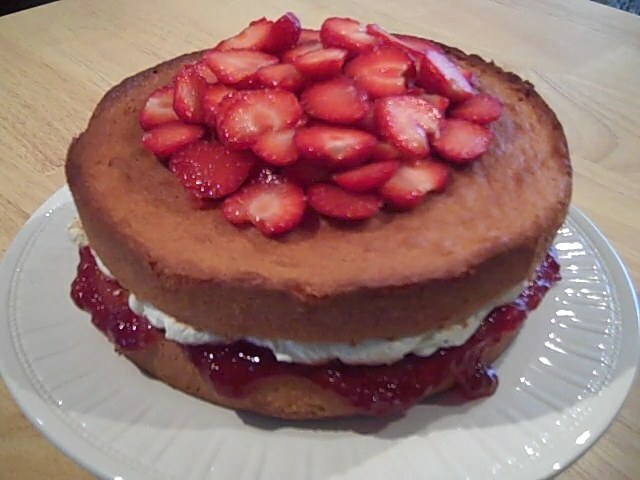 Once cooled, sandwich together with jam and buttercream, then arrange sliced strawberries on top. 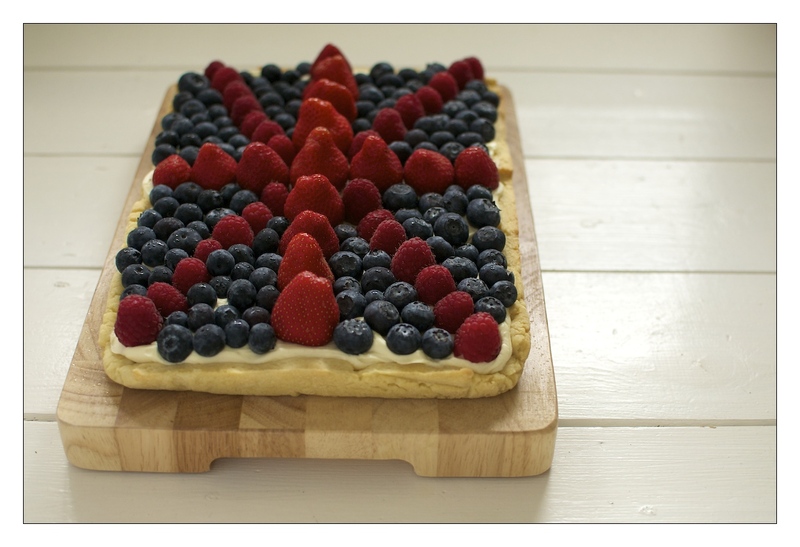 Create this spectacular tart for the Queen’s Jubilee celebration. Halve the strawberries or leave whole. Preheat the oven to 190C/gas mark 5. Line a 33 by 23cm shallow tin with baking parchment, leaving enough over the sides to be able to lift it out with. Put the flour and salt into a bowl, add the butter, and using your fingertips rub in until it looks like breadcrumbs. Stir in the 50g icing sugar. Mix the yolks with 2 Tbsp of cold water and add to the flour mixture to make a stiff dough, you may need more water – add only a tsp at a time. On a floured surface, roll out to 2cm larger than the tin. Carefully transfer to the tin. Press into the corners and sides. Prick the base with a fork and chill for 30 minutes. Line the pastry with baking parchment and fill with baking beans. Bake for 10 minutes, then remove the baking beans and parchment and bake for another 8 minutes. Leave to cool. Mix the mascarpone with the vanilla, creme fraiche and remaining icing sugar and spread inside the pastry case. 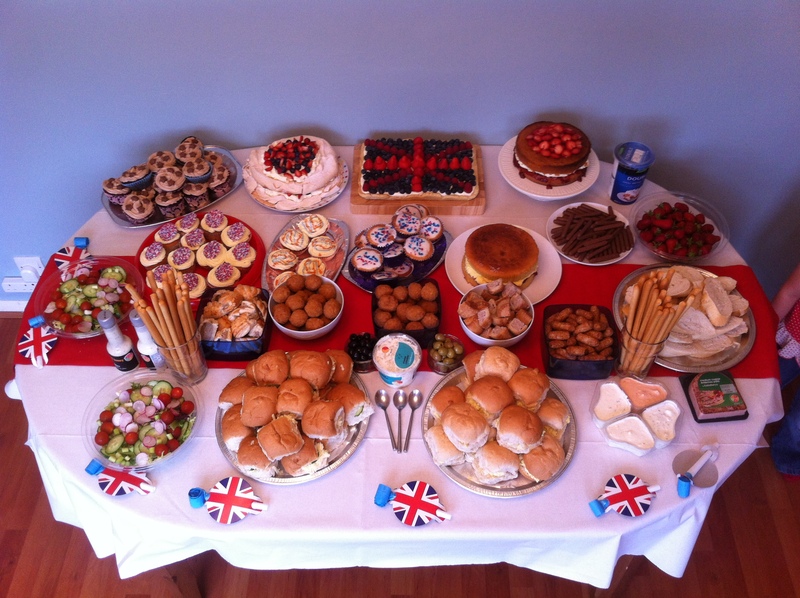 Arrange the berries (as in the pic above) to make a British flag.